The higher the profile, the higher the standard and that’s why so many Hollywood celebs are getting sacked for behavior that probably wouldn’t surface if happened to an average Joe. Take the case of Guardians of the Galaxy director James Gunn. Disney gave him his walking papers last week after offensive, ten-year-old Tweets rose to the surface. What’s different about this case is that many of Gunn’s actor friends publicly defended him and said Disney was wrong to fire him. It’s not that the Tweets weren’t offensive – they were, but those who know him say Gunn is a changed man. Should he lose his livelihood and his reputation because ten years ago he made some bad choices? He said some things he now regrets. He didn’t break the law and he doesn’t feel the same way today. It’s a tough call, especially if you’re family-friendly Disney. In a somewhat related story, media personality Chris Hardwick was un-suspended from his position as host of the TV series “The Talking Dead”. Hardwick was suspended last month after his former girlfriend posted an expose on the internet claiming he was emotionally and sexually abusive. Hardwick was immediately suspended not only from his show but he was also banned from participating in the Comic-Con panels he’s been hosting for years. That’s a huge move. Think about it. Who was the last public figure to be reinstated after an attack on his or her reputation? It doesn’t happen often and when it does, it still leaves a bad taste in the mouth. AMC says he’s cleared but how many people will stop watching the show because they believe him to be guilty? If you think building a reputation is hard, it’s cake compared to rebuilding it after a fall – whether you were guilty or not. The world’s top social network has been underfire lately for a variety of issues including encouraging the spread of misinformation, allowing an analytics firm to exploit data for political gain and for just plain being too creepy! (Facebook, stop peeking in my windows!) It’s easy to say that the world likes to do battle with the giants but turns out it’s not just the outsiders who expressed concern. A memo magically appeared in the media this week that was written by outgoing Facebook security chief Alex Stamos. In it, he takes some of the blame for the recent debacles, but he also says that he pushed for a less invasive environment. Profits are important, but when a company crosses the line to shore up their bottom line, it almost always comes to light. Once it does, their reputation takes the hit and the profits they gained are lost fighting a public battle to regain the respect of the customers and co-workers. You know what else comes before “profit” in the dictionary? People. Put them first in your business and you’ll do alright. 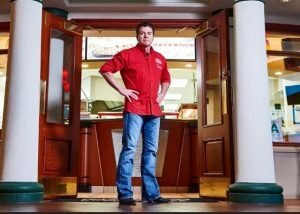 Pizza maven “Papa” John Schnatter was in the hot seat again this month, when he was caught using racial slurs on a conference call (bad choice). He resigned (good choice), then backpedaled days later saying his decision to leave the company was a mistake (bad choice). He claims the whole “n-word” blowup was a case of being quoted out of context and by resigning he’s allowing his name and the company name to be unfairly tainted. Sorry, no. Yesterday, Forbes published an in-depth article chronicling years of bad behavior on company time including spying on employees, sexually inappropriate comments and plenty of legal settlements and non-disclosure docs to keep it all under wraps. While Papa John haughtily denies it all in public, the company has to start thinking about a massive change. Given enough time, most companies can erase the memory of a bad CEO but how do you change the public’s perception when the offender’s name is on every door. If things get worse, the company may have no choice but to rebrand; a dangerous and expensive proposition. At the very least, the company needs to remove Schnatter’s face from all company advertising. Maybe if they replace him with a cartoon version, people will eventually forget that Papa John was a real and flawed person, after all. Somehow, billionaire inventor Elon Musk managed to turn a heart-wrenching rescue effort into a social media slapfest. Musk hastily built and delivered a mini-sub which he hoped could be used to rescue the young soccer team that was trapped in a flooded cave. One of the rescue divers called it a PR stunt and Musk fired back on Twitter calling the diver “pedo guy” and more. The Tweets were deleted and apologies were offered but speculators think Musk might be cracking under the pressure. He went from Tweeting 100 times a month, to 400 times a month often attacking others in the defense of himself and his company. Initially, Tesla stock dropped but has since bounced back. Musk’s loyal fans are also standing by his side. It appears that people are willing to write his angry Tweets off as the byproduct of his passion for making the world a better place. The takeaway here: you might get away with it as long as your heart is in the right place. MGM Resorts, owner of the Mandalay Bay hotel shocked the world this week when they filed lawsuits against more than 1,000 victims of last years mass shooting in Las Vegas. The move was designed to shield the hotel from liability by putting an Anti-Terrorism law into play. It’s all very legal and technical and after reading it over three times, I’m not sure even I understand why they had to countersue. What I do understand is that it sounds deplorable when you see it in the news. That’s not going to help the hotel’s already injured reputation. I’d guess that MGM is worried that fighting 1,000’s of individual lawsuits would drive the hotel to bankruptcy. But it seems to me, suing the victims of this terrible tragedy, is just a faster road to the same dead end. If you noticed a sharp decline in the number of people who follow you on Twitter as of this morning, don’t panic. It’s not your reputation that’s in trouble, it’s Twitter’s. According to the New York Times, Twitter is ruthlessly deleting tens of thousands of fake accounts. While the move is likely to help their reputation, it could hurt their bottom line. Like many companies, Twitter relies on its follower count as proof of concept. A drop in users often means a drop in stock prices. Which is ironic since the 6% of eliminated accounts weren’t real in the first place. Note to Twitter Influencers: if you’ve been charging sponsors based on a large number of fake followers, be prepared to take a pay cut. Though studies show that consumers support companies who give back to the community, in this case, the community just wants Costco to give back their fattening but yummy, lunchtime treat. While Twitter is eliminating fake users, YouTube is trying a different tactic to keep the fake news from spreading through the site. Rather than shut down users, YouTube is launching a program that will give viewers more information when they search for certain topics. Not sure if the moon landing really happened? YouTube will serve up a Wikipedia link above the results so you can decide if TheMoonIsInHollywood knows what he’s talking about or not. They’re also working on displaying links to reliable written content by known journalists to round out coverage of breaking news stories. YouTube is hoping that the initiative will raise the level of trust in the company and in turn promote their reputation as a reliable source for news. Does cutting ties with an offender instantly save your company’s reputation? Last week, Netflix fired its communications chief for using racial slurs in meetings. ABC cut ties with Roseanne Barr after she posted inappropriate comments on Twitter. This past Monday, Uber’s Chief People Officer (that’s a real thing?) turned in her resignation after she was accused of ignoring employee complaints of discrimination and harassment. In all three cases, the parting was very public but does that mean the public is ready to forgive and forget? Not always. ABC’s swift action saved them from further embarrassment but Uber and Netflix will have to dig a little deeper. A toxic company culture doesn’t revolve around one person, so firing one person won’t solve the problem. If Uber’s Chief People Officer was fired for ignoring complaints, that means there were plenty of other problem employees out there who still need to be dealt with. For more on that, check out this Inc article by Sonia Thompson with tips on how to protect your company culture. 7-11’s marketing team must have been patting themselves on the back six months ago when they finalized the deal to bring two hot commodities: Deadpool and Funko into stores in time for a big movie release. When word hit the streets that the convenience store was going to stock exclusive Deadpool Funko Pops, collectors went wild. They counted the hours until release day, then rushed into their nearest 7-11 with cash in hand the moment the clock struck twelve. Seconds later, they walked out disappointed with all of that cash still in hand. Then they moved on to the next 7-11 store, and the next and the next. . . I personally hit three. On social media, collectors spoke of hitting 11 and calling every store within an hour’s drive. And who finally found the illusive chimichanga-clutching superhero? Not one person in all of the United States came home with the promised toy. To make matters worse, most of the employees had no idea what the collectors were talking about! Funko? Pop? Toy? 7-11 doesn’t carry toys, but we do have these Deadpool straws and Slurpee cups. Cute, but not even close. In case you’re not familiar with the toy, Funko Pops are the hottest thing in collectible vinyl figures. They retail for $9 to $14 dollars when they first bow but many are “vaulted” after a short period of time. On the secondary market, vaulted figures can sell anywhere from $100 to $1,000. To make them even more valuable, Funko releases numerous variations of the figures as store exclusives in places like Target, Barnes and Noble and Hot Topic. And they release an even more limited version of some figures called “chases”. Find one of these “in the wild” and you really are sitting on gold. For the release of Deadpool 2 (a Marvel superhero movie), Funko created a half dozen variations of the titled character and invited collectors to travel to each retailer in order to collect the full line. It’s marketing genius because it pushes people to shop in a store they wouldn’t normally visit – like 7-11. I’m a Diet Coke girl and for a week, I changed my routine and bought my soda at 7-11 even though it meant going out of my way, just for a chance of scoring one of those rare Funko figures, but all I got out of it was a sour taste for both the movie and the franchise. On launch day, dozens of people Tweeted 7-11 asking how to find the Pop. At first, there was no reply at all. Then, the official channel began sending out vague replies saying that only some stores would get them “later this week”. When asked which stores. They replied that they had no way of knowing. Which makes no sense. Since the stores had to pre-order the toys, 7-11 Corporate has an exact record of which stores were getting them, so why not publish the list? For some reason, 7-11 also chose not to even mention the toys on their social channels, or even on their website. They did promote the straws and the Deadpool themed Trolli candy but not the toys. Why? The one manager I found who knew what I was talking about told me the toys were delayed because of a change in the movie release date. If that’s true, all 7-11 had to do to calm the angry natives was to go online and say so. Instead, they stood by and watched as 100’s, then 1,000’s of potential customers left their stores angry and confused. A few days after the official launch date, one collector found a Deadpool Pop in Washington State. A day later, a couple more showed up in California. This beacon of hope had angry collectors putting their hatred for 7-11 aside long enough to make another try but most came away empty-handed and angrier than ever before. Think it can’t get worse? It got worse. This week, collectors are online with a new horror story. They’re finding the precious pops, but the store owners are refusing to sell them for the $14 retail price. One collector had to fork over $30 bucks to get his. Is that legal? Many 7-11’s are independently owned but does that mean they can make up their own prices? 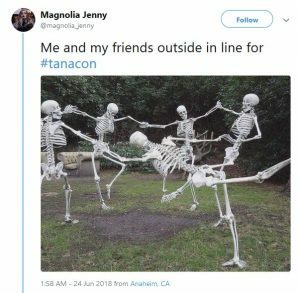 Now, it’s not just the franchise that is taking the hit, collectors are calling on Funko to put a stop to the madness. And now it’s their reputation on the line. I know, you’re saying to yourself, “all this craziness over a toy?” Yes and no. What it’s really about are the promises a store makes to its customers. When 7-11 and Funko entered into an agreement to sell a special toy on a given day, they had an obligation to make that happen. If circumstances prevented it from happening, then they had an obligation to notify their customers through social media channels and through the employees of the store. A huge part of the problem with the entire campaign was the lack of communication between corporate and the man behind the counter. Even if a store is independently run, 7-11 needed to make sure every owner understood the marketing plan and then that plan needed to be explained to every employee. We’re talking about a concept that can be explained with a picture of the toy and a single page memo. Hang it in the breakroom and have your employees initial it to say they read it. It’s easy. Because they didn’t communicate properly, internally or externally, 7-11’s great marketing coup is worse than a bust. It’s actually hurting the company. And it’s hurting the associated properties Deadpool and Funko by association. 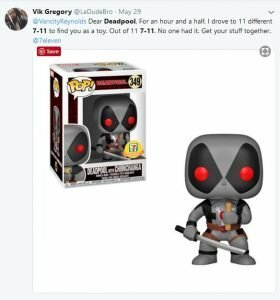 Yesterday, one of the most influential Funko Pop collectors on YouTube (yes, it’s a thing) said he never wanted to hear the words Deadpool or 7-11 ever again. That’s not the words you want to hear when you’ve poured millions of dollars into a marketing campaign. Ten days have passed. If you want an exclusive 7-11 Deadpool Funko you can buy one on eBay but it will cost you around $100. I wouldn’t be surprised if some of those sellers are 7-11 managers or employees who decided a bigger payday was in order. I don’t blame them for making a profit. I blame the 7-11 marketing department and social media managers for not protecting their most valuable assets – their customers.